We didn't have a lot of money when I was growing up, so my parents were always looking for creative, thrifty ways to keep my sister and I entertained. 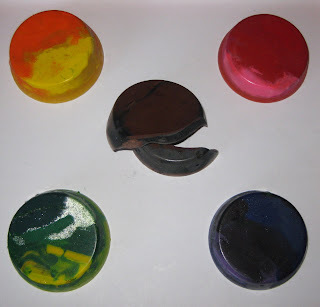 One such idea was to take all of our broken, worn down crayons and melt them to make new ones! This idea has been around for a long time and I know it's nothing new to some of you, but I thought a certain Australian might find it interesting (Hi, D!) so I had to post it. :) Plus, James will get a kick out of them, too. No pics of him enjoying them just yet - I'm saving these for his Christmas stocking! Painstakingly remove the paper from each crayon (this is best done in front of the telly with a glass of wine). 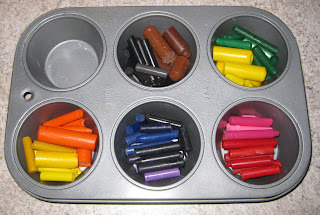 Break up the crayons and group them into your preferred color combination in a muffin tin. Turn off the oven and place the tin on the middle rack. After about 10 minutes or so you'll see the wax melt and pool. Let them cool completely. You can put them in the freezer to speed up the cooling process. That's it! Now you have new, funky, chunky crayons! DO NOT use washable crayons - they'll leave a layer of clear wax along the top resulting in useless coloring. DO NOT use those jumbo crayons. Here I was thinking, oh yeah I'll get more wax from these bad boys, but nope. They refused to melt completely no matter how long I left them in the oven. Also, a few cracks occurred right where the jumbo crayons were... coincidence? I think not. We used to a version of these growing up too. :) I really like the muffin tin way though and I love the idea of them as stocking stuffers:) Thanks for writing down the directions - as well as some hints!! I have a bunch of crayons from restaurants that would work great! What a great idea!!! I'm going to make some tonight! I have a tip you might like for the next time you make these--forget the tedious label peeling! Simply put the crayons in a bowl of warm water for just few minutes and the labels slip right off!